Together – that’s what’s most enjoyable at singing! For this reason you can buy more than 150,000 choral pieces in a variety of styles in our shop. Choose to your heart's content, and we deliver the sheet music quickly to you. Mozarts Fragment mit den Ergänzungen von Joseph Eybler und Franz Xaver Süßmayr. Our extensive catalogue with over 150,000 choral sheet music titles from every style and publisher offers you something for every occasion! 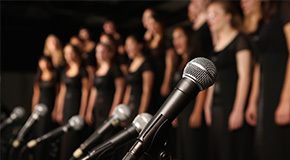 Here you will not only find original works and arrangements for male / female and mixed choirs with and without accompaniment from classical, church music, jazz, folk, pop, rock, musicals or film, but also accompaniment CDs and literature about choral singing.